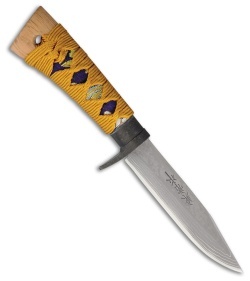 Attractive and functional the Kanetsune Kin-Nishiki fixed blade knife combines traditional Japanese craftsmanship with modern manufacturing and materials. Featuring a 4.75" 15 layer damascus blade with a Blue Steel core takes an exceptional edge while each knife has a unique damascus pattern. A classic black steel finger guard provides additional safety and is an attractive contasts the the gold Tsukamaki wrapped oak handle. 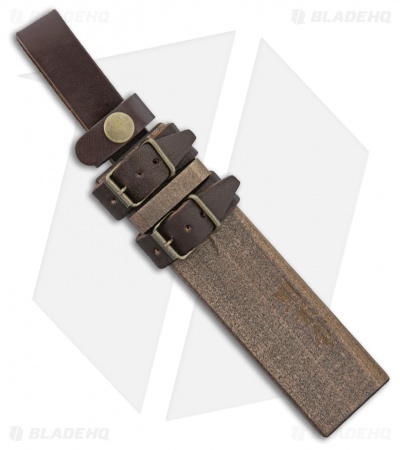 A dark magnolia wood sheath with brown leather straps allows for easy carry or a beautiful display item.